Providing a glimpse into the future of the LCV (light commercial vehicle), Hyundai Motor’s H350 Fuel Cell Concept shows the suitability of the company’s pioneering Fuel Cell powertrain for commercial application. The vehicle is displayed at the 2016 IAA Commercial Vehicle Show in Hanover. Unlike a conventional electric vehicle, which requires a number of hours to recharge, the 175-litre hydrogen tank can be filled in under four minutes – similar to the time it takes to refill a tank of gasoline or diesel in a vehicle with a traditional internal combustion engine. The H350 Fuel Cell Concept has a total range of 422 km, and emits only water. The powertrain is intelligently packaged in such a way that its installation has no impact on the H350’s load area. Depending on wheelbase, the H350 provides 10.5 m³ or 12.9 m³ space – sufficient to accommodate five standard European pallets – or room for a 14-seat passenger compartment. The Fuel Cell driveline enables almost silent operation of the vehicle contributing also to a reduction in noise pollution what makes it especially suitable for night deliveries in urban areas. The H350 Fuel Cell concept would be suitable not only for door to door and urban missions, but also to extended mileage missions thanks to the improved autonomy. 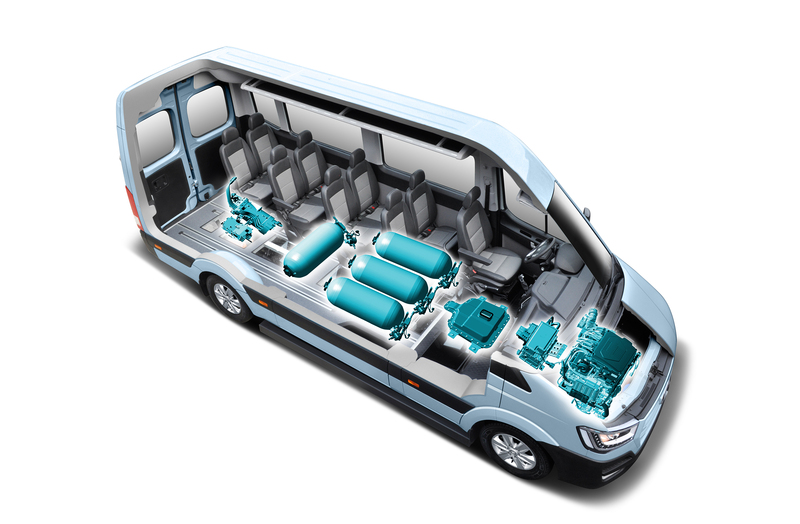 With the Fuel Cell powertrain capable of producing up to 100 kW (136 ps) and 30.6 kg.m, the H350 Fuel Cell Concept is able to reach speeds of up to 150 kph – similar performance to LCVs powered by an equivalent internal combustion engine. Propelled by a near-silent electric motor, it also produces significantly less noise than conventional vehicles.